Dependable Digestion Changes Your View. What do you miss when you can’t count on yours? PowerZyme Prime Digestive Enzymes Comprehensive Enzyme Supplement PowerZyme Prime Digestive Enzymes is a broad- spectrum, high-potency, enzyme formulation containing plant and microbial-based digestive enzymes to assist the body in maintaining optimum enzyme levels, supporting intestinal repair, easing digestive disorders, and boosting the availability of nutritional components during the digestion process. This combination of enzymes encourage maximum breakdown and absorption of the nutrients that make up your body's vital building blocks, including proteins and protein peptides, fats, disaccharides and carbohydrates, to name a few. PowerZyme Prime™ serves as a necessary tool for gastrointestinal-compromised individuals who suffer from intestinal inflammation, maldigestion, malabsorption, or dysbiosis. FOCUSING ON BASICS means ensuring the proper digestion of food so your body can absorb the basic building blocks of life. PowerZyme Prime Full-Spectrum Digestive Enzymes are essential digestive support. * When I was in college, last night’s pizza box was called breakfast… Now, I can barely digest a banana. * I used to eat a 4-course meal and then go dancing… Now, I get bloated and sleepy just walking past a buffet table. * I never had indigestion, heartburn or gas, until after I turned 30… Now, it is the guaranteed penalty for the joy of eating out. * I used to set my watch by my regularity… Now, the only thing regular is the constipation and weight gain. * There was a time when I would always leave a QuickMart with a product that said, “Sweet & Delicious”… Now, that product always says, “For Fast Relief”. If any of those sound familiar, you are like the rest of us who experience similar loss of digestion response. Change Your Digestion Woe to a Wow! Okay, I admit my digestion is Off more than On… So, now what?” There are several issues contributing to your compromised digestion. Age, by itself, is a factor. Like it or not, as we age, our body’s ability to produce adequate digestive enzymes is reduced. a big meal”),eventually exhausting the supply of digestive enzymes available. You can’t do a whole lot about getting older, but you do have influence over the factors above. You can stop chewing gum. You can chew your food better. And you can make more healthy choices with the types of foods you eat. But even with those changes, you still live in the real world, right? You may not dine on empty Dominoes Pizza cartons anymore, but you do still want to eat the occasional slice of pizza. And, even though you never buy packaged foods from the center isles at grocery stores, you do want to sometimes eat at a restaurant without cursing the inevitable bloating symptoms that follow. 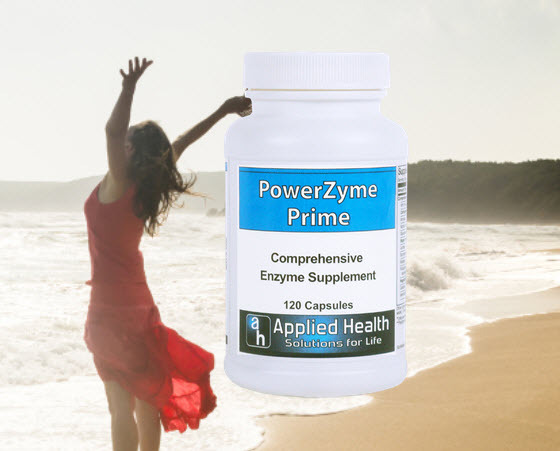 It is for reasons like those that we came up with PowerZyme Prime, the comprehensive, full-spectrum, digestive enzyme formula, designed for sensitive digestive systems and today’s busy lifestyle. This high-potency, multi-enzyme formulation offers an unusually complete range of plant/microbial-based enzymes that work in concert to help maintain normal enzyme levels that support the body’s digestive capabilities and assist intestinal repair mechanisms. The broad-spectrum combination of enzymes in PowerZyme Prime maximizes the breakdown, absorption, and utilization of macronutrients from the widest spectrum of foods, including proteins and protein peptides, carbohydrates, disaccharides, and sugars, lipids/fats, and vegetable fibers. As such, PowerZyme Prime can serve as an important dietary adjunct for individuals requiring maximal nutrient uptake and for those with compromised gastrointestinal function such as maldigestion, malabsorption, dysbiosis, or intestinal inflammation. As we age, our bodies lose their natural abilities to produce enough enzymes. Especially when most of our diets consists of cooked foods. When we cook food, the natural enzymes contained within the food are destroyed in the process. This is why we should be eating as many raw foods as we can on a daily basis. This is also why supplementing your diet with a high-quality, full-spectrum digestive enzyme supplement is essential. 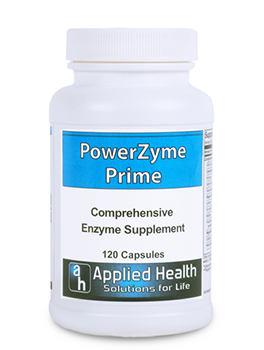 Applied Health’s PowerZyme Prime is one of the most potent and easily absorbed form of digestive enzymes available today. PowerZyme helps eliminate or prevent many common digestive problems from occurring. 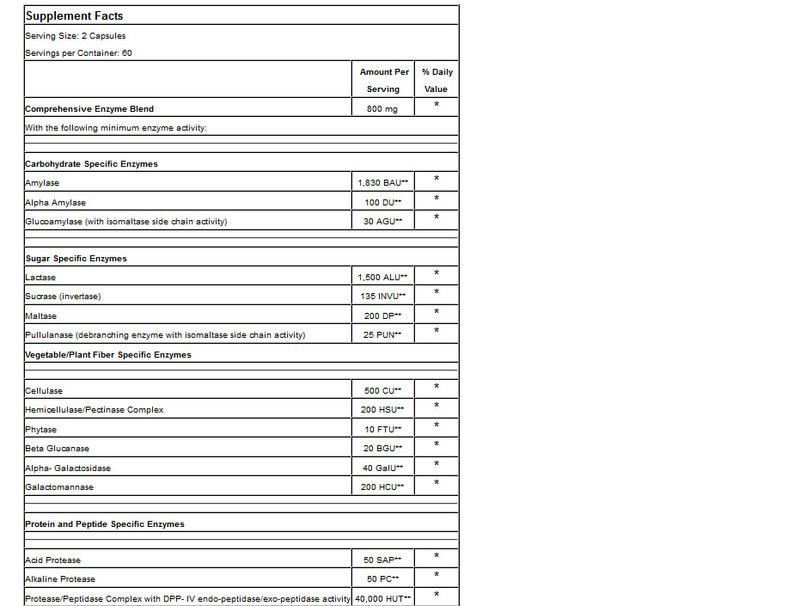 Frequently Asked Questions (FAQ's) What Are Enzymes? Enzymes are proteins that are responsible for initiating a process, or change. The enzymes that are naturally-occurring in the human body catalyze, or accelerate, all normal biochemical reactions in the body. Enzymes are responsible for all metabolic functions and many are absolutely vital for life itself. Enzyme proteins are very specific regarding their purpose and the exact conditions in which they are able to do it. Imagine a threaded nut and bolt… the enzyme and substrate must fit correctly in order to work. What Types of Enzymes do I Need? No matter what types of foods you eat, all foods are made up of protein, fat, carbohydrate and fiber. Various types of digestive enzymes break down each of these into smaller and smaller components. Your body uses these smallest pieces as building blocks to rebuild and heal itself, supply energy and remove toxins. This process of breaking foods into the smallest components means less undigested foods are passed into the colon, and allows your body to absorb more of the nutrients it needs. Carbohydrases such as amylase, lactase and invertase break down carbohydrates and starches, polysaccharides, sugars and fiber as are found in fruits, vegetables and grains. Proteases such as neutral bacterial protease and peptidase break down protein found in meats, nuts, cheese and grains such as whole wheat. Lipases break down fats and oils, such as those found in olive oil, fish oil, cooking oils, butter, cheese and meat. What is the Difference Between Plant/Microbial vs. Animal Enzymes? Plant and Microbial enzymes have a much broader pH range and can work throughout the digestive tract. The pH environment of the digestive tract is highly variable and can range from very acidic in the stomach to quite alkaline in the small intestine. Most enzyme supplements derived from animal sources are enteric coated because of their lack of stability in the acidity of the gastric region. Fortunately enzymes derived from microbial or plant sources are stable throughout a much broader range and are ideally suited for survival and activity throughout the gastrointestinal tract. Doesn't My Body Make It's Own Enzymes? 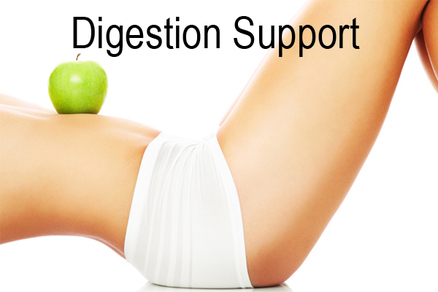 The human body makes many different digestive enzymes. The digestion of food takes place in stages: beginning in the mouth then moving to the stomach and finally into the small intestine. When food enters the upper portion of the small intestine, the pancreas provides pancreatic enzymes to further break down the food. At each step, specific enzymes break down different types of food. Final breakdown of remaining small molecules of food occurs in the lower small intestine. Do Enzyme Supplements Survive the Acid in the Stomach? Because we choose to use plant/microbial-based enzymes, with their natural viability in a much broader pH range, the suggestions that stomach acid will destroy supplemental enzymes is not valid. It is not uncommon for food to remain in your stomach for as much as an hour, the period when supplemental enzymes perform much of the digestion activity prior to digestive secretions becoming mixed with the food. Initially, digestive secretions are very acidic (low pH 1.0-1.5), but the presence of the food raises the pH usually to the range of 2.5-5.0. In this range, many microbial enzymes perform at their best. How Often Should I Take Digestive Enzymes? With every meal. Unless your meal consists of all raw, fresh ingredients, your body will need enzymes to breakdown the foods. We have seen several claims from some so-called “authorities” on health who are selling their version of a digestive enzyme product in which they claim you only need to take it “once per day”. That might work, but only if you plan to EAT just once per day. Don’t be fooled by this strategy. This is done to excuse the small quantity of doses in the bottle, allowing them to price the product at a fraction of products from companies that are serious about solutions. If a company is willing to adopt this type of pricing strategy — at your ultimate expense — then you might ask yourself, “how else are they compromising the quality”. To follow our recommendations of taking enzymes with every meal, it means being prepared to carry with you at least one dose when you leave the house for the day. We never suggest taking the whole bottle in a purse or pocket. Enzymes are sensitive to various environmental factors, and you do not want to expose them needlessly to harmful conditions. What is the Best Time to Take Digestive Enzymes? Just as you sit down and are ready to take your first bite of your meal. This way, the enzymes will already be present when the first bite of food hits your stomach. If it is a particularly large meal, it doesn’t hurt to follow up the meal with an additional capsule.